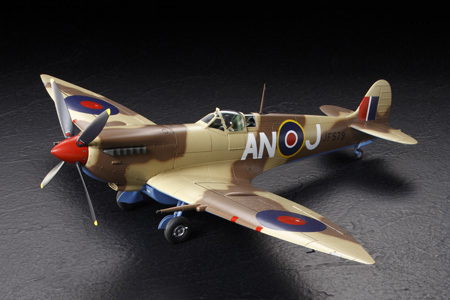 TAMIYA 60320 SPITFIRE MK.VIII (1/32) scale model kit! 1/32 scale plastic assembly kit of the Spitfire Mk.VIII. Overall Length: 302mm, Overall Width: 383mm. Features of the Mk.VIII, including the retractable tail wheel, shortened ailerons, and wing fuel tanks, have all been accurately reproduced. .You can select either retracted or deployed landing gear and tail wheel even after assembly. Parts to depict standard and extended wingtips included Features moveable ailerons, rudder, and elevators. Flaps can be depicted in either up or down position. Parts for 30 and 90 gallon fuel tanks included. Comes with 3 kinds of markings to depict the aircraft from USAAF, RAAF, and RCAF units. Comes with 2 pilot figures, 1 seated and 1 standing.